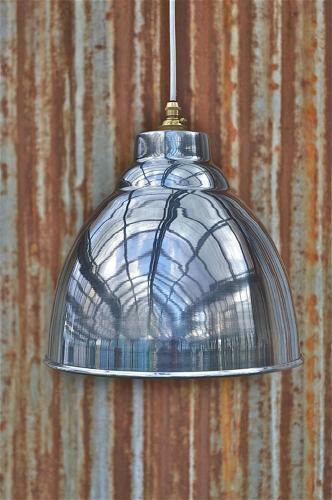 A cool vintage style industrial hanging light pendant. Made from aluminium with a highly polished finish. The light comes with a UK made solid brass B22 bayonet bulb holder with integral cord grip. 23.5cms tall and 28cms diameter. 9 1/4 inches tall and 11 inches diameter. Please note that the wire and ceiling rose are not included but we have a full range available in our shop.